Hurricane Katrina devastated New Orleans, taking lives and livelihoods and displacing thousands. Because the hurricane struck at the beginning of the school year, the city’s children were among those most affected. Michael Tisserand, former editor of the alternative cultural newspaper Gambit Weekly, evacuated with his family to New Iberia, Louisiana. Then, rather than waiting to find out when—or if—schools in New Orleans would reopen, Tisserand and other parents persuaded one of his children’s teachers, Paul Reynaud, to start a school among the sugarcane fields. So was born the Sugarcane Academy—as the children themselves named it—and so also began an experience none of Reynaud’s pupils will ever forget. This inspiring book shows how a dedicated teacher made the best out of the worst situation, and how the children of New Orleans, of all backgrounds and races, adjusted to Katrina’s consequences. MICHAEL TISSERAND is the author of The Kingdom of Zydeco, which won the ASCAP Deems Taylor Award for music writing. He served as editor of Gambit Weekly, the alternative newsweekly of New Orleans. He lives in Evanston, Illinois. "This wonderful memoir manages to do what a flood of news-reporting could not: see the tragedy of Katrina through the eyes of children. I was touched by the depth of feeling that wells from these pages, and I was heartened by the resilience and courage of these Children of the Storm. Katrina impressed itself indelibly on a generation of New Orleans children, and Tisserand makes the complexity real through the story of his own children and that of their friends in exile. The story of The Sugarcane Academy, an improvised one-room school in a sugar-cane parish in south Louisiana, will be one of the lasting books of our tragedy." "Through his personal account, the experiences of his two children and the stories of people he encounters, Tisserand is able to accomplish what the extensive news coverage could not: He puts a human face on the tragedy, allowing readers to better understand the experiences of the victims of Katrina." "Michael Tisserand knows more about life in New Orleans than anybody else I know. 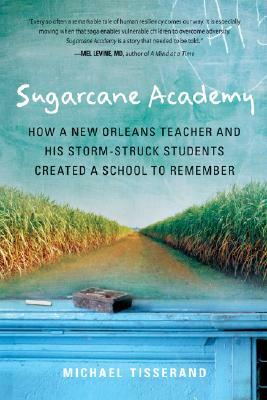 Sugarcane Academy is a poignant, well-written and awe-inspiring non-fiction saga of Louisiana citizens coping with Katrina's wrath. Highly recommended." "When journalist Michael Tisserand and his family found themselves escaping the maelstrom of Hurricane Katrina, he turned his investigative eye on the aftermath as his family and others helped create a one-room schoolhouse for evacuee children. This true story of how determination, faith, and a sheer force of will allowed learning and hope to blossom in the office space that became the only public school open in New Orleans." "The contrast between the hopefulness and ingenuity of the parents,students and teachers who created the school and the despair of downtrodden bureaucrats and volunteers who, in Tisserand's gentle telling, established policies and protocols that become roadblocks to spiritual and physical regeneration is huge." "Every so often a remarkable tale of human resiliency comes our way. It is especially moving when that saga enables vulnerable children to overcome adversity. Sugarcane Academy is a story that needed to be told. The contents of its pages open our eyes to how a disaster in New Orleans can bring forth creativity and empathy that we all need to emulate." "With his sharp eye for detail and his abundant heart, Tisserand paints a devastating portrait of the toll exacted by Hurricane Katrina, particularly on the children. Simple, compelling, and quietly dramatic, Sugarcane Academy is both eulogy and commencement -- a tribute to the endurance of the human spirit." "A testament to the teachers who supported Katrina's children, Sugarcane Academy reminds us all that heroes hold small hands on field trips, clean paint brushes, and sing morning songs." "This book delivers insightful anecdotes on the incredible misfortune Katrina wrought. But it also embodies the spirit of the people who rose from the floodwaters and dared to plant seeds of hope in the sugarcane fields." "A slender but appealing book...[about] a remarkable teacher named Paul Reynaud, the sort of person who has a gift for understanding children's wants and needs..."
"[Tisserand's] 'Sugarcane Academy: How a New Orleans Teacher and His Storm-Struck Students Created a School to Remember' is that seemingly impossible thing -- a gentle, hopeful tale about the displaced and the small Cajun town where they landed...It's an Oprah-worthy story sure to resonate with young urban parents...Quiet and powerful." "Heartwarming...The story of Sugarcane Academy is as inspiring as it is moving and sometimes sad, and as much a reflection on the resilience of children and dedicated teachers as it is on the hardships faced by everyone displaced by the storm."